These spooky little mummies are so simple, yet so fun to make. With a little prep work, even toddlers can join in the fun! 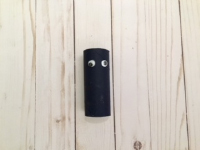 Paint an empty toilet paper roll black. Once the paint is dry, use the glue stick to add two mummy eyes. 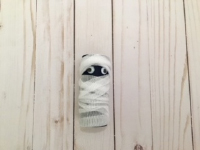 Wrap the gauze around the toilet paper roll, leaving a small opening for the mummy’s eyes to peek out. Once the toilet paper roll is completely wrapped, tuck the end piece into the gauze, in the back. That’s it! 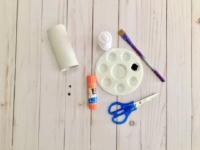 A quick, easy, and fun Halloween craft!